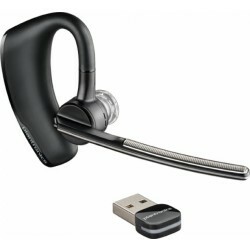 Part of Plantronics' very popular Voyager range of headsets the 6200 is really a neckset! With a rigid behind the neck band for those who don't like headbands or earhooks. Greta for those who don't want have earbuds in all the time but need to respond quickly when a call comes in. 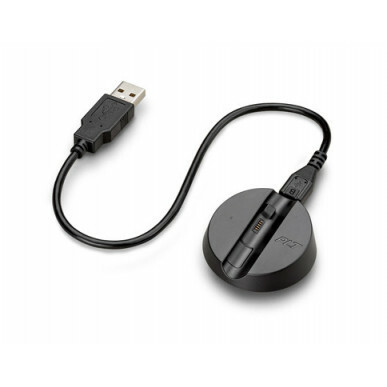 For use with mobile and PC only (not deskphone unless your model phone can connect to BT or has a USB headset port). Designed for use in noisy environments it has Active Noise Cancelling (ANC) in the eartips - Microphones in the headset listen for background noise and actively cancel them out helping you to focus on the call or of course you can use when working to listen to music, audiobooks or podcasts to additionally block out noisy colleagues. 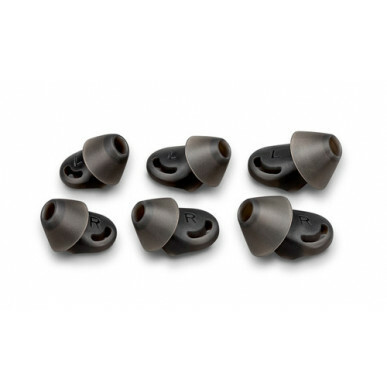 The 6200 can be worn with either 1 earbud (to make you more approachable and aware of your environment or both for the full 'block out the world' experience. You can of course turn the ANC off for when you want to be a little more aware of the world. The headset will also announce who is calling (as long as they're in your contacts list - it's not psychic!) so you know whether to use the voice prompts to 'answer' or 'ignore' the call. 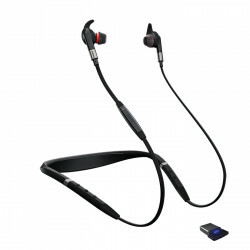 The neckband also vibrates to alert you to a call so you can discretely answer quickly you have the earbuds out without having to keep one eye on your phone all the time. The headset will be simultaneously paired with the dongle and 1 BT device so you can easily switch from computer to mobile phone use. When not in use the earbuds can dangle down ready for use, they don't retract and they're not magnetised like the Jabra Evolve 75e, (Plantronics missed a trick there). There's a dedicated mute button which alerts you when pressed. The microphones are situated on the front of both sides of the neckband so you can turn your head either way and still be heard clearly. 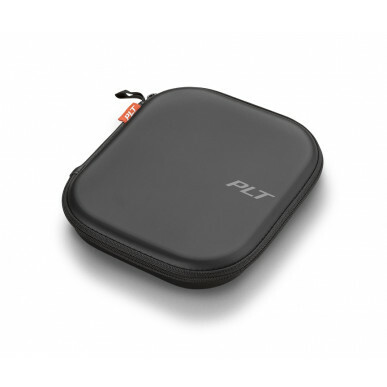 The handy travel case keeps the headset, dongle and cable all together when not in use. A charge 'stand' is included, which should really be called a charge 'sit' or 'lie' as the headset still sits on the desk with just the right side raised a little in the 'stand' to charge. It comes wiht earbus in small, medium & large included so you know you'll get a good fit. Unlike older headset models, this serves for use with Lync and Skype for business as well as other programs. You'll get good quality sound and seamless switching between calls and music. Audio requirements for these 12 types of usage are very different as anyone who's used a headset designed for phone only could tell you!. Wideband audio provides high quality PC telephony and and smatyphones enabled for HD voice,. 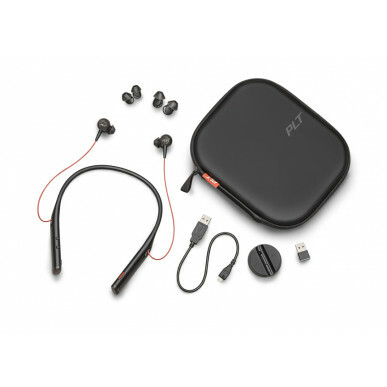 Bluetooth V4.1 means that you get additional range from your headset with up to 30 meters (But please note your PHONE must be Class 1 Bluetooth) as well as NFC connection. 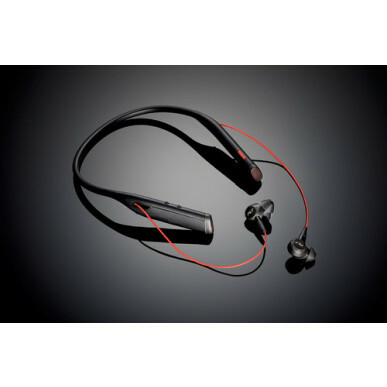 Boomless design features Plantronics clear talk technology, four omnidirectional microphones and enhanced noise canceling, optimizing your voice and minimizing background noise. On-demand passive and active noise canceling (ANC) block out distractions so you can focus on your call or work.. 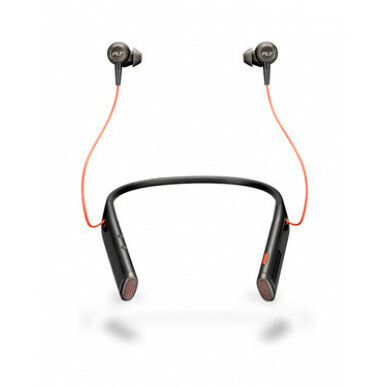 Premium wireless hi-fi stereo headset works seamlessly across multiple applications on desktops, Bluetooth®-enabled desk phones, laptops, mobile phones and tablets..
Neckband vibrates to alert you of incoming calls; so there’s no need to look at your mobile phone. Switch from stereo to mono to hear your surroundings simply by dropping an earbud, or remove both earbuds for face-to-face conversations. 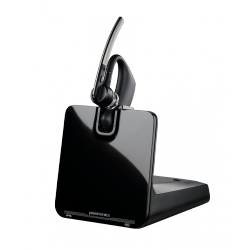 Wideband audio provides high-quality PC telephony and is compatible with smartphones enabled for HD voice. Dynamic mute alert senses when you start to talk while the headset is on mute and sends you a voice prompt. 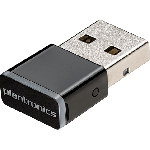 Plantronics Manager Pro, software-as-a-service that is sold separately, enables your IT team to gain insight into every Plantronics headset being used company-wide.